This gruesome, cruel "sport" involves mounted riders chasing a horse around and around while a man on the ground tries to rope the horses legs. Every time the horse is tripped the contestant receive another point. 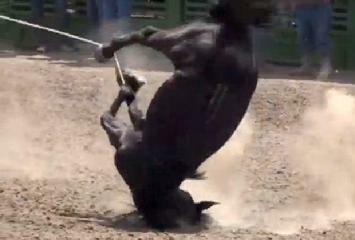 Mares and young horses are used most frequently because they are smaller and easier to trip. These poor horses are run without any regard to their health and wellbeing. To make things even worse, these horses are frequently "borrowed" or rented from sale barn facilities, where they are returned to continue their forced march into slaughter in Mexico. 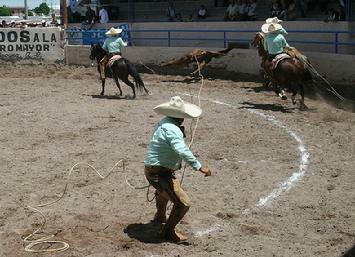 These events - called Charreadas - are a national sport in Mexico and are now being seen across the western United States. Arizona, California, Florida, Illinois, Kansas, Maine, Nevada, New Mexico, Nebraska, Oklahoma, Oregon, Rhode Island and Texas have all banned horse tripping. Support the SAFE Act so no horses go to Mexico for slaughter, thereby removing the availability of horses to subject to this appalling event. WRITE to your federal officials to raise their awareness.